We conclude our series on the Southern live oak with a look at dead trees that have taken on new life. Some Southern live oaks that did not survive Hurricane Katrina have been reborn as art. 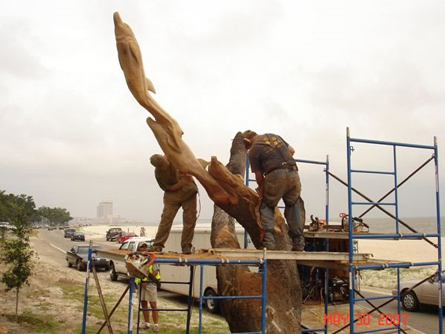 In Biloxi, artists Dayton Scoggins and Marlin Miller took up the task of converting over 20 dead trees, mostly along Beach Boulevard, into sculptures celebrating coastal wildlife: pelicans, eagles, seahorses, whales, dolphins, swordfish, and more. The sculptures have been featured on MSNBC and elsewhere and are one of the top attractions on the coast. (The City of Biloxi has pictures and video here). And so the live oak continues to be a deep-rooted part of Southern culture and character — one that, like the Gulf Coast, will endure and continue to grow. 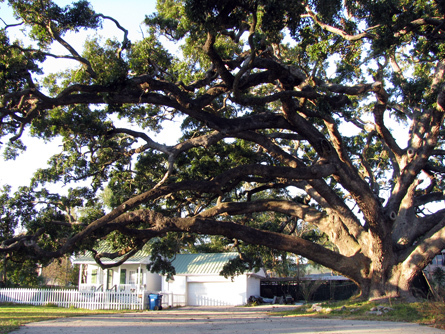 Previous: Hurricane Katrina and the Southern live oak.